It’s the end of the session and the dining hall at GSNC Camp Blue Bay is filled with the sound of happy campers talking and engaging with their new friends. This is much different picture than what we saw at the start of the week; the awkwardness of campers, thumbs fidgeting in the absence of their electronic devices. Camp Blue Bay is an electronic free zone; and it is one of the reasons why myself, other camp staff and campers love camp so much! Campers hug their phones goodbye as they board the buses thinking there is no way they will be able to make it a week without them. Surprisingly to them by the end of the week they are actually grateful for their time disconnected. There is no WiFi at camp, girls have the opportunity to make a different connection, a more personable one. It’s great to watch campers meet and connect with other girls face to face and learn important social skills. Campers listen to the ideas of others and take part in meaningful conversations without being distracted by a constant buzzing in their pockets. Camp creates connections you won’t be able to find anywhere else. My best relationships are all with people I’ve met at camp. One of the greatest benefits is learning to be independent! Campers don’t call home for mom every time they need something; they learn to make decisions and do things for themselves! I always find it surprising how many campers ask me what I think they should do or doubt their abilities, and although I’m always there to offer guidance I find it important that they learn to make their own decisions. Being in the absence of electronics provides a more thought-provoking environment for campers. They are less worried about what is going on in cyberspace and can be more in the moment. Without google at their fingertips campers use their own problem solving skills, experiment, and learn from their mistakes. Instead of watching a YouTube video on how to pitch a tent campers learn from each other and try different things to see what works best. An electronic free zone encourages campers to get out and about on the sports field or hands on in the arts & crafts room! A camper who started off the week saying the only activity she enjoyed is video games is now the first one to the basketball court! Reducing technology use increases creativity; girls who once claimed they weren’t artsy are now head to toe in paint, glue and glitter. Without electronics campers are open to trying activities they might have ignored before. Electronic free = Judgment free; campers feel a sense of security without social media around every the corner. Detaching from technology brings reduction in stress and anxiety. Someone who may be unsure about performing at the talent show feels more comfortable knowing their every move won’t be documented. Campers gain the confidence they need to be themselves, they don’t have a screen or a profile to hide behind. As they get off the buses back in Nassau County it’s not their phones they are holding on to; instead it’s the friendships, experiences and memories that will last a lifetime. And for the next couple of days they’ll probably forget to charge their phone, skip the TV before bed, and actually engage in a dinner table conversation. They have created a connection to the world only some people can be lucky enough to have, one that doesn’t require a WiFi password. Next, the Troop took a trip to Safety Town to help earn part of their Junior Safety Award pin on bicycle safety. The girls had a great time! Would you like to share what your Troop is doing? Email your photo and brief description of your Troop activity to marketing@gsnc.org. 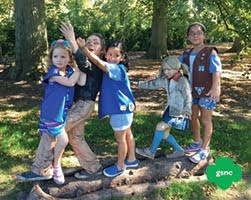 Don’t forget to include your Troop number and the name of each Girl Scout in the photo! 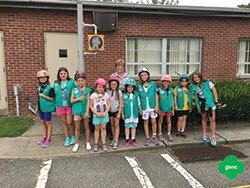 Troop 3242, participated in a Girl Scout educational program at Old Westbury Gardens. They were provided with elements of badges for the girls such as Senses for Brownies and Flowers for the Daisies. The girls loved seeing the amazing statues by Seward Johnson positioned throughout the gardens and mansion. 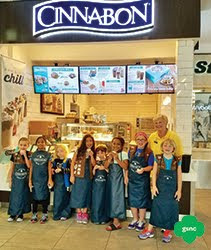 The girls also took a tour of Cinnabon at Broadway Mall and sampled some tasty treats! Isabella has been GSNC’s top seller for 4 years in a row and she’s already set her goal so she can earn the top reward again this year—a trip to Niagara Falls! Will you be joining her? It takes a lot of effort to sell so many boxes of Cookies, but Isabella is a real entrepreneurial G.I.R.L. (Go-getter, Innovator, Risk-taker and Leader)TM. 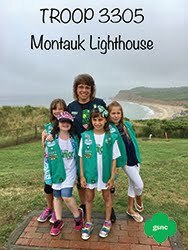 In 2017 she worked hard with her Leader and Troop Cookie Manager to not only reach her own goals, but to support the Five Skills (Goal Setting, Decision Making, People Skills, Money Management and Business Ethics) of the rest of her Troop members. One of the girls in her Troop sold over 2000 boxes and two additional girls sold over 1000 boxes! How did they do it? One reason can be attributed to over 75 booth sales—most of them outdoors! The booth sales and other successful girl-led sales tips (Door-to-door selling, online sales, social networking, telephone sales, and workplace sales) require lots of support from parents and the other adults in your Troop. You really need to be a go-getter to be a goal-getter!